This longevity tea contains six superior tonic herbs, Eleuthero root (“Siberian Ginseng), Goji berry, Schizandra berry, Astragalus root and Luo Han Guo fruit. Its five premier tonic herbs are extracted and concentrated into a paste, which is then soaked into the Gynostemma leaves to make this luxurious longevity tea. Consumed daily, this powerful tonic tea is a double direction Qi tonic, which helps with energy during the long day, but it can also help relax and provide a restful sleep. Qi is a vital energy that is held to animate the internal body. It is critical for not only daily energy, but for self-defense and exercise. The basis of this tea, Gynostemma leaves, are helpful in helping maintain stable blood sugar levels, and, according to Japanese and Chinese studies, have shown to make improvements in cholesterol levels with its superior adaptogenic formula. Native to Southeast Asia, these leaves are known for its ability to prolong life, which gave it its reputation to be the “Herb of Immortality”. Gynostemma has the broadest known range of saponins in the world, containing more than double the number of ginseng. Saponions elevate cardiovascular health due to their capabilities to lower cholesterol and body fat levels. This caffeine-free formula not only helps your heart and daily health, but it also supports healthy aging. Easy and convenient to make, each bag creates 3-4 servings. After placing the powder into the hot water, wait 15 minutes for it to infuse before enjoying. Designed for daily consumption, this tea can be given to those young, old, healthy, and sick. Although, if you are breastfeeding, pregnant, or consuming blood thinners, it is recommended that you speak to a health care professional before using. 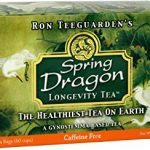 If you are ready for a long and healthy life, check out Dragon Herbs Spring Dragon Longevity Tea at Renewed Health Supply.